It’s an interesting conjecture for young defenders in the current footballing space. Attacking full-backs and ball-playing central defenders have become the norm, and the more pertinent ability to ‘defend’ has lost it’s spark. But we, with our rankings, try to ensure we reward all aspects of a defenders skill set – be it the exciting attacking attributes, or solidity at the back. In tenth spot at the moment is Atletico Madrid’s French defender, Lucas Hernandez. With some good performances, and unfortunate injuries to others, the 21-year-old has been a regular option for Diego Simeone even with the likes of Jose Gimenez and Diego Godin in the squad. Defending champion from last season, Davinson Sanchez is in 9th spot with a solid enough start to life in London. Having moved in the summer from Ajax, the Colombian has fitted in perfectly into Mauricio Pochettino’s system. Ahead of them in eight place is AZ Alkmaar’s 21-year-old Dutch left-back, Thomas Ouwejan. The youngster is finally enjoying a regular run of games in the first team and has impressed with his defensive shifts – a lost art with modern full-backs. 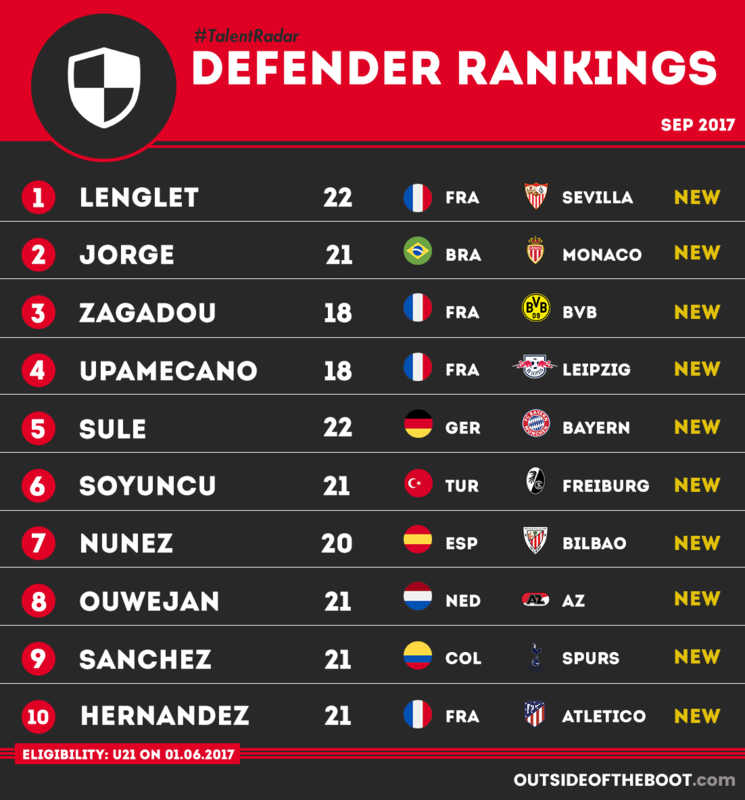 Spaniard Unai Nunez takes seventh spot; with fellow youngster Yeray Alvarez out injured, the 20-year-old has formed a formidable partnership with Aymeric Laporte. Coach Cuco Ziganda has been impressed with Nunez, trusting him over some of the more experienced personnel and starting the youngster in every La Liga game thus far. Turk Caglar Soyuncu completes the bottom half as the 20-year-old has continued to grow in confidence having been given his opportunities at Freiburg. The youngster was particularly impressive in Freiburg’s commendable goalless draw at home to free-scoring Borussia Dortmund. Bayern Munich’s summer signing, Niklas Sule is the first into the top five with the former Hoffenheim man finding life fairly comfortable in the heart of the champions’ defence. The German even managed to grab a goal on opening day and will no doubt be a contender to go one or two better than his second runners-up spot in these rankings last season. Dayot Upamecano who initially struggled to fit into life in German Bundesliga last season after his January move, has had a contrasting uptick in form & confidence. The teenager has been nothing short of solid in Leipzig’s defence having started every single game for his side across all three competitions. The side who had a fairy-tale campaign last season, may be looking to challenge again as the sports betting offered by Betway suggests, no doubt that the form of Upamecano will be crucial there. When Dan-Axel Zagadou joined Dortmund from Paris Saint-Germain in the summer, not too many took notice. While it was two high profile clubs involved in the transfer, the player involved was rather unknown. Fast track few months and there’s no doubt the Germans have pulled off a master-stroke. He made his debut against Bayern Munich in the Super Cup and hasn’t looked back since. Who needs Benjamin Mendy? Monaco’s French full-back had an unforgettable 2016-17 campaign and was duly rewarded with a move to Manchester City. But looking to challenge Mendy’s impressive campaign, Jorge, has stepped up both in Monaco’s first team and our rankings. The 21-year-old Brazilian has played all ninety minutes of every Ligue 1 and Champions League game this season. Mendy finished second in last season’s rankings (and is ineligible this season); Jorge might just go one better than his former team-mate? 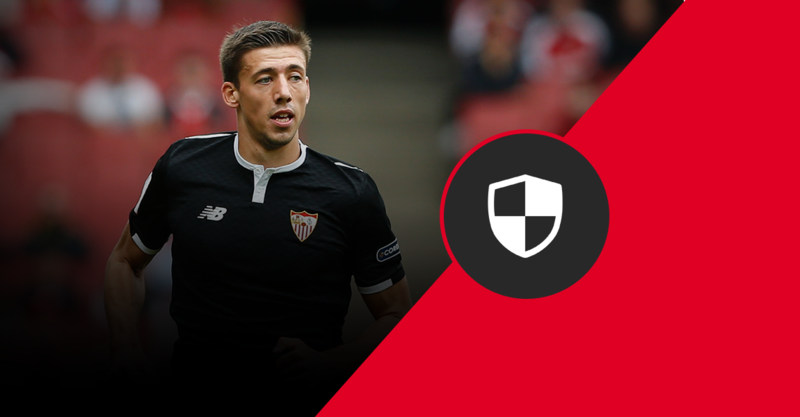 And in top spot is the fourth different Frenchman to make this edition of the rankings – Sevilla’s Clement Lenglet. The 22-year-old has continued to impress with his Spanish employers who took a chance with him last January having seen the young defender impress at Nancy in Ligue 1. Lenglet has certainly repaid the faith, despite the managerial changes at the helm. 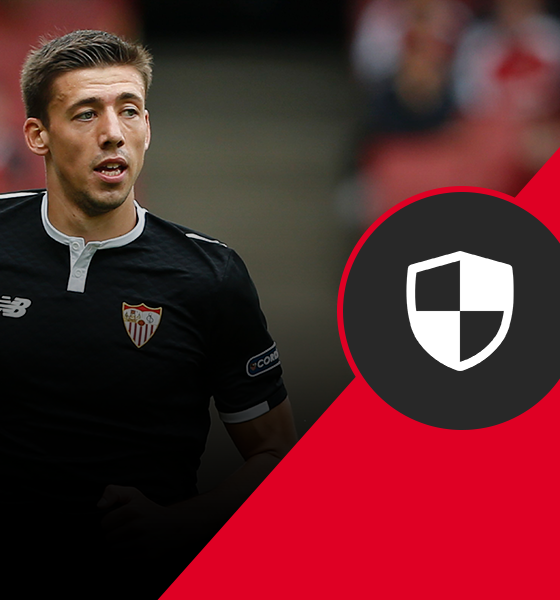 There’s no shortage of French talents across Europe, Lenglet may be a fairly late bloomer compared to the others – but he’s certainly taking his chances this season.